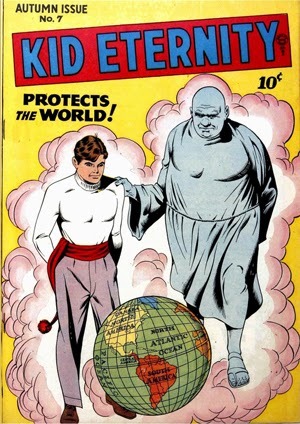 I’ll start things off with an oft forgotten character who, to date, has been referenced a whopping ZERO times in any form of expanded media: Kid Eternity. The Kid was created by Quality Comics in 1942 for a series called Hit Comics and made frequent appearances before getting his own ongoing series. Originally, the character was not given a proper name. He was only ever referred to as Kid, most likely as a way of creating a cypher that young readers could identify with and more easily imagine themselves in his sneakers.